Phil Baker is an analyst at the Regulatory Assistance Project (RAP). In 2014 Great Britain (GB) introduced a market-wide capacity mechanism in the belief that necessary investment in generation capacity could not be supported by energy market pricing alone. The Government has now begun a mid-term review of the mechanism, looking at whether it is still needed and, if so, how its design could be improved. As part of our contribution to the review, we have examined the capacity mechanism’s performance to date and highlighted three issues that other EU Member States contemplating the introduction of a capacity mechanism may wish to consider. While the capacity mechanism has arguably fulfilled its primary purpose of contracting sufficient capacity to meet GB’s reliability standard, it has failed to achieve its real objective of bringing forward sufficient investment in new combined cycle gas turbine (CCGT) capacity to replace aging coal and nuclear plant. This failure stems from a persistent surplus of capacity, which has resulted in auction clearing prices well below that necessary to deliver the desired investment. In other words, Great Britain has not really had a capacity problem to solve – the capacity mechanism is a solution to a problem that has yet to emerge. Further evidence of the lack of any capacity problem is that Great Britain entered the winter of 2017/18 (the first delivery winter) with a de-rated capacity margin (excess capacity over peak demand adjusted for plant availability) of 10%, significantly higher than the 3% required to satisfy the reliability standard. 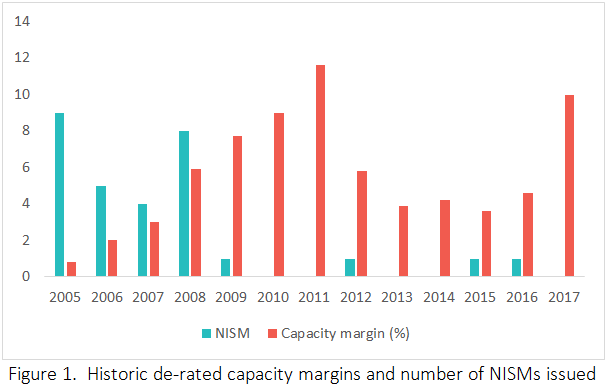 In fact, despite a downturn in the first half of the decade, de-rated capacity margin has increased in recent years as illustrated in figure 1 below. This is mirrored by the fact that the most significant indicator of reliability in real time, the frequency of Notices of Insufficient System Margin (NISM) issued by National Grid, has declined markedly in recent years. It appears that, despite the Government’s concern that the electricity market can no longer be relied upon to deliver new capacity, supply reliability in Great Britain is actually in very good shape. Transmission System Operators (TSOs), such as National Grid, will be deeply involved in the design and operation of a capacity mechanism. However, while TSOs are exposed to the operational and reputational consequences of a capacity shortfall, they are not exposed to the costs of measures taken to avoid those shortfalls. This introduces a tendency to over-procure which, in GB’s case, can arguably be seen in a number of areas. An analysis of National Grid’s demand forecasting over recent years shows an average over-estimation of around 1.5 GW, while a conservative approach can also be detected in generator availability assumptions and in the sensitivities used to determine capacity requirements. For example, the assumption of 11-13% CCGT non-availability seems unjustifiably high compared with both actual outturn of around 6% and international data, while the sensitivities around the non-delivery of contracted capacity seem unjustifiably pessimistic. While some prudence is of course justified given the uncertainties associated with estimating future capacity requirements, the costs to electricity consumers of an unnecessarily conservative approach do need to be recognised. Market-wide or targeted capacity mechanisms? There is strong evidence that well-designed energy markets are capable of supporting supply reliability at least-cost, even in a renewables-dominated world. In fact, this is the rock on which the Commission’s Market Design Initiative (MDI) is built. However, governments will not want to take chances with supply reliability and it is easy to see the attractions of introducing additional measures to ensure reliability of supply. One means of achieving this without moving to a market-wide capacity mechanism, is to adopt a targeted strategic reserve. A limited amount of capacity would be held outside the market and used only when the market failed to clear. Wholesale energy prices would be allowed to rise to reflect scarcity and, in this respect, a strategic reserve would be more consistent with the MDI reforms. Recent British experience provides a useful insight into how cost-effective a combination of market reform and a strategic reserve could be in achieving reliability. 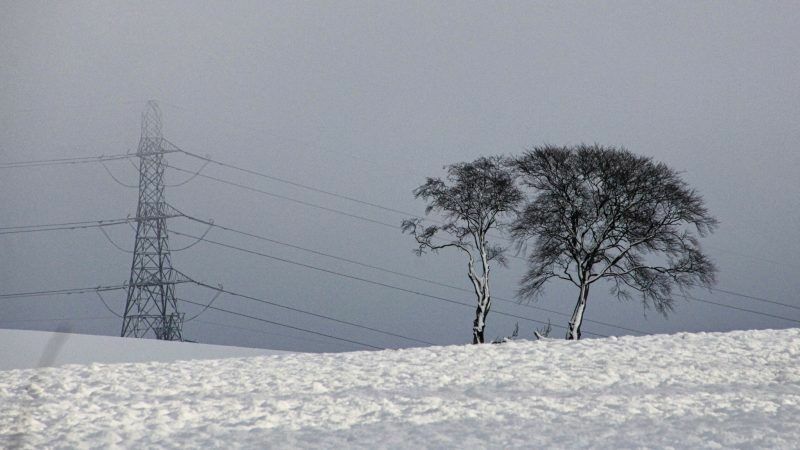 The cost of contracting 3.5 GW of strategic reserve for winter 2016/17 was £122 million while that of its replacement – advancing the first capacity mechanism delivery year to 2017/18 – was £378 million. Taking into account the estimated reduction in energy market revenues of around £150 million, this initial and admittedly tentative analysis suggests that continuing with the strategic reserve rather than bringing forward the first capacity mechanism delivery year would have resulted in a net saving for the year of around £100 million. In other words, market reform plus a strategic reserve may well be a more cost-effective option than a market-wide capacity mechanism. It can be claimed that the capacity mechanism has contracted sufficient capacity to meet the GB reliability standard. However, it has failed to achieve its real objective of new investment in CCGT capacity – a failure rooted in a surplus of capacity depressing auction prices. This highlights the importance of timing – no market can be expected to signal the need for new capacity unless that need actually exists. The issue of timing is complicated by the conservatism of TSOs and governments who will be keen to avoid the reputational and political consequences of any shortfall in supply, even those that commonly-accepted reliability standards assume will occur only on rare occasions. This conservatism is leading to a tendency to over-procure capacity. The final point of interest is that a targeted strategic reserve, together with well-designed market reforms, is likely to be a more cost-reflective alternative to a market-wide capacity mechanism. What is certainly true is that a strategic reserve is far more consistent with the MDI reforms and also represents a simpler exit option if it is decided that energy markets alone can deliver the required level of supply reliability.